When we were kids we used to like digging big holes in the orchard. The joke was that if you dug deep enough you would come out in China. Of course we never thought we could dig all the way to China. Besides this was during the Cold War so we knew that Americans were not allowed to go to China. Calvin had his Hobbes, and my son Stephan had Top. Top was a stuffed penguin I bought as a gift for my wife, but when Stephan was just a baby he decided Top was his. Stephan loved Top and thus all penguins. The Pittsburgh Penguins became his favorite sports team. For some reason my kid’s schools thought the kids should decide what their career will be before they were even teenagers. Stephan was a smart kid and it seemed very likely he could become a scientist. So I pondered the idea of him becoming some kind of researcher going to Antarctica to study penguins. He however went a different direction. Stephan will be getting his PhD in mathematics this spring. My father was a scientist and was invited to go on a sabbatical to Antarctica with Dr. Wolf Vishniac to do research on detecting life on Mars. However he decided to go on a sabbatical to New England instead. So the point of all this, I never dreamt of going to Antarctica. It was something someone else might do, but wasn't something I considered doing myself. Fat bikes and the amazing Eric Larsen changes that. I also never thought I would go to China. 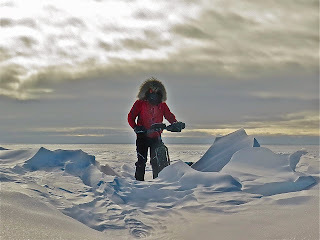 My South Pole expedition has changed that also. I have been invited to go to Shanghai to help someone plan for his Antarctic expedition. So I'll see if I can figure out how to add some blog posts while I'm there. Hmmm, before Antarctica visiting all the continents was not on my list, after China I will only have two more to go.